Most of us think of ham steaks as a salty, reddish pink cut packaged in single thick slices — simply open the package, toss in a pan and heat until crispy to serve. Once removed from the pan, leftover juices are turned into a red-eye gravy for some. Served with eggs at breakfast, this is the classic cured country ham steak. Today I've been looking forward to sharing a recipe for uncured ham steak. You typically will not find them uncured in a big box grocery store, so your butcher or specialty grocery store will work. If living in RVA, we are lucky to have Harvest Grocery & Supply which now not only carries uncured ham steaks but a variety of pork cuts from heritage rare breed mulefoot hogs from Lockhart Family Farm 40 minutes north of Richmond. You might recognize Lockhart Family as the same farm I purchased a whole hog from last year. The American Mulefoot is one of the oldest and rarest breeds of swine in North America, with the Livestock Conservancy claiming there are fewer than 200 annual breed registrations, making it critically endangered. Prized for their fat content and taste, the American Mulefoot thrives in a woodland setting and its meat has some of the reddest and best marbling of all breeds. The Mulefoot’s name comes from its unconventional feet which are not cloven and instead look like that of a mule. With competition from large scale factory farms, it is imperative that consumers and farmers work together to make a market for these amazing creatures and bring them back from near extinction. This breed has also been chosen as one of Slow Food’s “Ark of Taste” animals due to its exceptional taste and need for conservation. Starting with the brine, mix all of the wet ingredients and spices into a medium saucepan. Heat over medium until the liquid comes to a light simmer, stirring the mixture until the salt is dissolved. Remove from the stove and allow to cool. 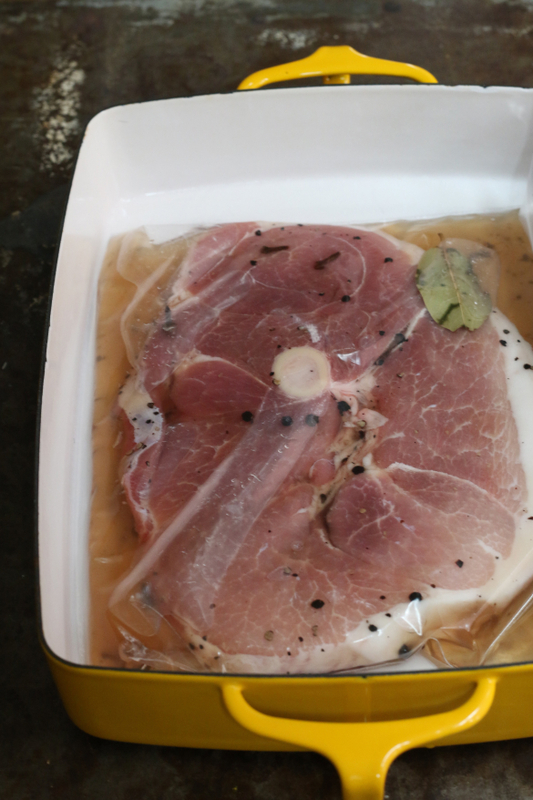 Once cool place the ham steak into a large bag and pour the brine over it. Remove the air from the bag and seal. Lay the bag into a dish (in case the bag leaks) and place in the refrigerator for 24 hours. 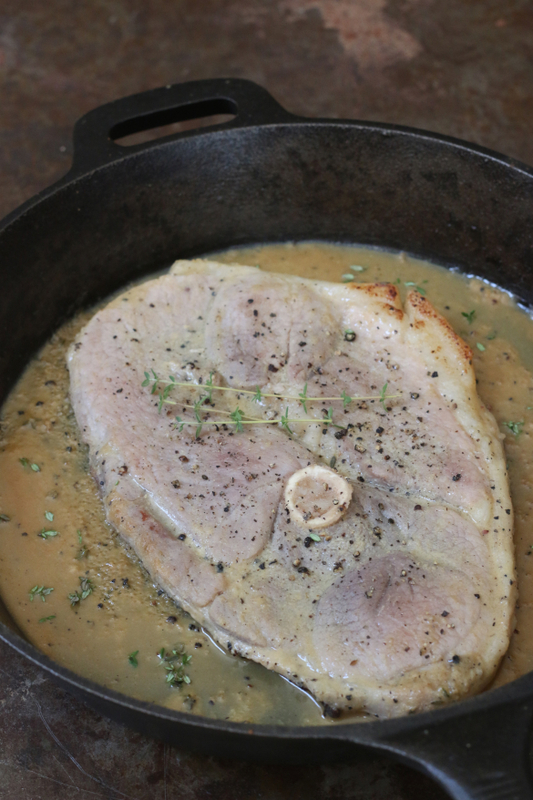 Turn the ham steak several times during the brining process. Once the brining process is complete remove the steak from the bag and rinse well. Dry with a paper towel and set aside. 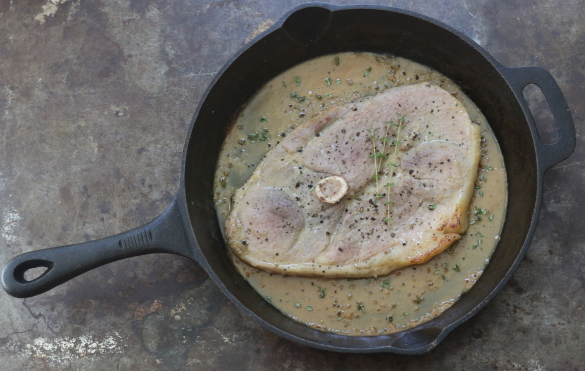 Place a cast iron pan in the oven and preheat to 375°. While the oven is preheating grind pepper on each side of the steak. Once the oven is at temperature, carefully remove the pan and place the steak directly inside, returning to the oven. Roast the steak in the oven (18-20 minutes per pound) flipping half way through. 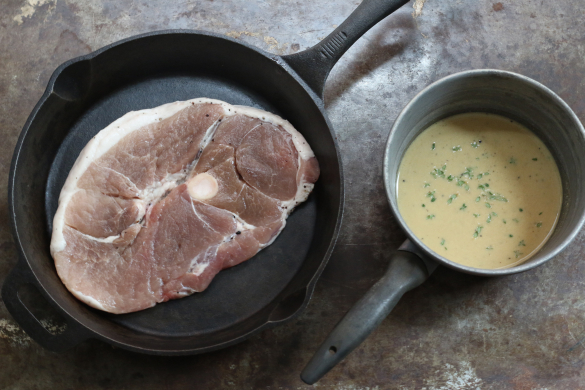 While the steak is cooking, mix the ingredients for your gravy and heat over low heat on the stovetop. 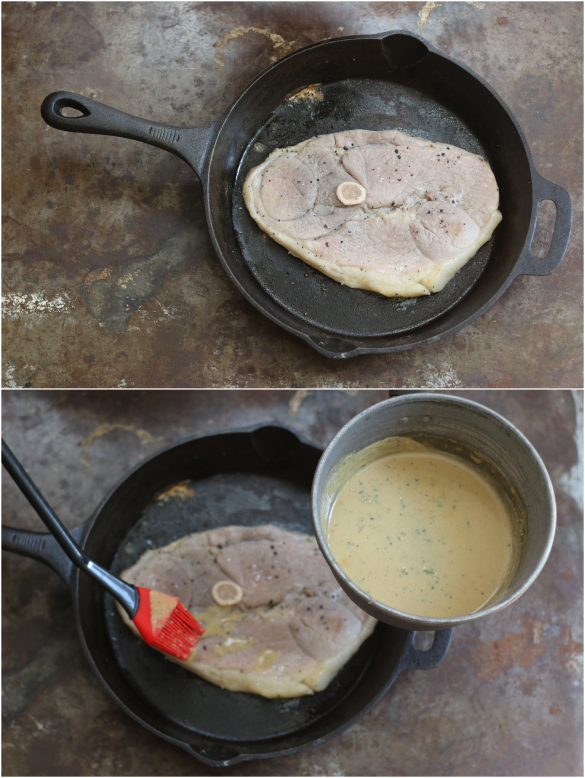 Remove roast from the oven and baste with the now warmed whiskey mustard gravy, flipping to baste the other side. Once coated I drizzled the gravy around the steak. 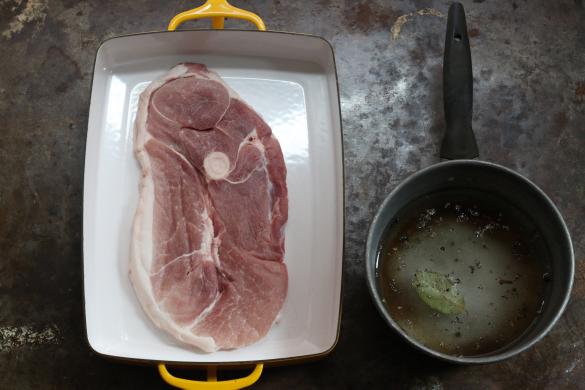 Return to the oven for 8-10 minutes or until pork reaches an internal temperature of about 140°. Remove from oven and place on a platter with the gravy or serve directly from the cast iron pan. The ham can be cut into smaller pieces and served individually. This dish was amazing and can be served with a side of collard greens for a true southern feel!